Maggie's Big Home: Indoor Activities! Play "Stop and Go" by having children tip-toe around the room. You say, "Stop," and children need to freeze where they are. Continue playing to help children move but in a controlled fashion. This is perfect for large groups of children. Ask children to move like various animals. This lets them move muscles and helps them think about how animals travel from place to place. Suggest they silently move like an elephant, slither like a snake, or hop like a kangaroo. This has the added benefit of developing vocabulary! Make a tent with blankets over a table. Have children crawl in and out of the tent. Use words like inside, outside, on, under, etc. to help children develop vocabulary. Make snow angels indoors! Have children lie on the floor and make the motions they would in the snow to create a snow angel. When they get up, use the power of imagination to point out the wings, head, etc. Continue with imaginary play by having children make a pretend indoor snowman. Have them work together to roll the snowballs, lift them on top of one another, put in eyes, nose, etc. Then stand back and admire the pretend creation. There is lots of movement with this dramatic play. Use painter's tape to make a square, circle, and triangle on the floor. Give children directions to jump into the desired shape. This lets them hop with purpose and also gives practice with shape names. Tape several old newspapers to the wall to create a large backdrop. Give children practice with arm movement by letting them write or scribble on the papers. This helps develop arm muscles needed for fine motor control, too. 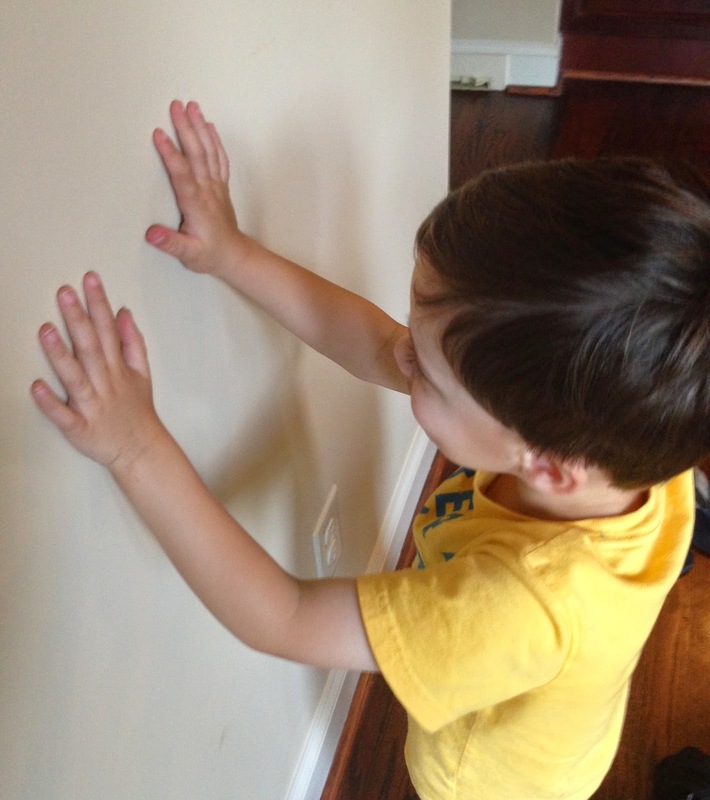 Children can also develop these arm muscles by doing wall push-ups. Have them stand in front of a wall, put their palms on the wall, and move back and forth with just their arms as they gently touch their nose to the wall. This is also a help in developing fine motor skills. In our techy age, we sometimes forget the simple games that we as adults enjoyed (and learned from!) as children. Do you remember “I Spy?” Simply pick an object in a waiting room, car, or while standing in line at the grocery store. Just say, “I spy something green.” Let your children guess. Then trade places. This is simple, fun, and helps children think about their surroundings. Not to mention – it keeps young ones busy in often boring situations. Another simple game for preschoolers is Tic-Tac-Toe. I recently played this with a four year-old using colors. 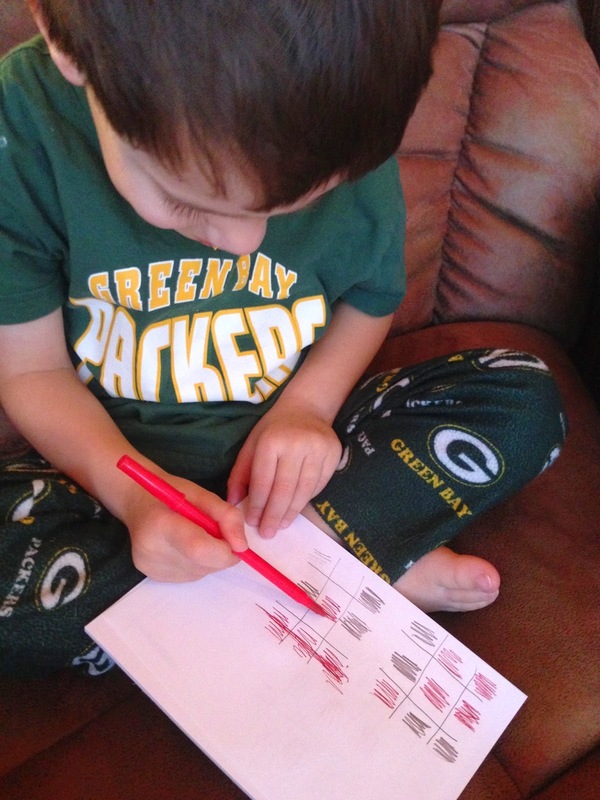 He used a red pencil while I used a green pencil. We marked our squares as shown below. There was lots of laughter - - - and learning as he quickly understood there was a strategy to the game. Even an indoor day can keep young minds busy. There is learning rather than the chance for a preschooler to become bored or annoyed. Head Start: I.C. ; I.D. ; III.B.;VIII.A. Several work environments require somewhat a bit of teamwork in order for things to run smoothly and with motivation to each in everyone. Team building exercises are effective in creating a relationship between coworkers.